I first met Ole last December, where he was selling coffee at the christmas party for Danish Broadcasting. 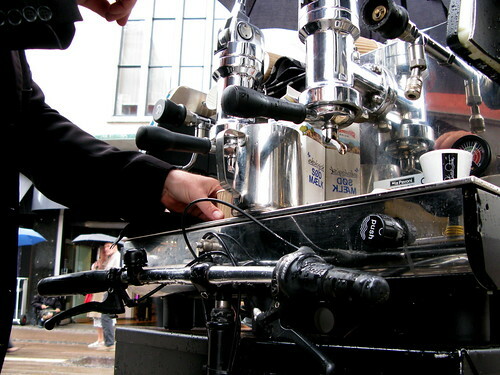 I promptly blogged about his Coffee Bike. It was great to bump into him again on one of our main pedestrian streets in the heart of Copenhagen. Espressomanden - The Espresso Man as Ole is called - is gaining quite the reputation. He is busy being booked for receptions, weddings, company parties - basically anywhere groups of people congregate and need coffee. But he is also a recognisable figure on the streets of the city. It was a drizzly day so his umbrellas were up. 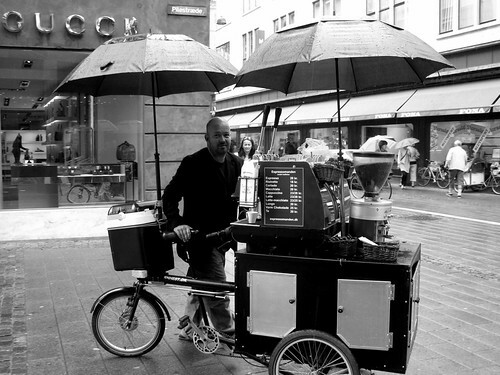 Business is good, however, and since I first met him he has modified his coffee bike. He still uses a Sorte Jernhest cargo bike, mainly because it can carry 150 kg compared to 100 kg on other Danish cargo bike brands. He has a new coffee machine and a new set-up so he is completely mobile and doesn't need to think about finding an electricity outlet. He is totally mobilee is much more mobile now. If business is slow on one street corner, he justs hops into the saddle and pedals casually away to find greener pastures. But the beauty of it is that you can raise a finger and hail a coffee in between A and B. Ole will hop off and whip up a well-made coffee for you. 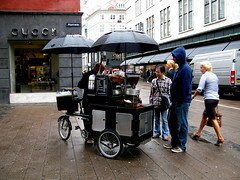 The City of Copenhagen has recently eased up on restrictions on street vending and, generally, outdoor business. In order to create more life on the streets it is now easier and cheaper to apply for permission to have tables on the sidewalk outside your café or to sell goods on the streets. This is why we're seeing new cargo bikes on the streets like the Fruit Bike, newspaper bikes and a boom in rickshaws, among many other bikes. It's one thing having great numbers of citizens filling the streets and bike lanes but it's taking it one step further having bikes selling goods on the streets. 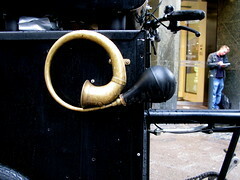 It's aesthetic, practical and rather cool and underlines the status of the bicycle here in Copenhagen. Ole admites he has the World's Best Job. Working outside in the ancient and lovely centre of Copenhagen with chic Copenhageners walking or bicycling past. He also admits that the latter is a distracting factor but it's not one he would be without. By the way, the coffee is delicious.